I have asked a selection of successful leaders to share their insights on leadership and motivation. Phil Sampson has learned leadership the hard way as an officer in the Royal Marines for 32 years. He has lead organisations on operations and has been involved in leadership development and coaching as a trainer throughout his career. 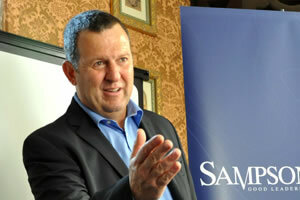 Now a partner at Sampson Hall, he has delivered to conferences nationally and internationally. He brings a wealth of leadership experience and some novel leadership perspectives to business along with the Sampson Hall Gordian Model. 1. What is the key to great leadership? I am a firm believer in empowerment as the speed of life increases. So for me the key is listening in order to gain understanding. For if you know where you are and who you have, you can set out a credible vision for the future that wins buy in and understanding from all your team. After all it is vision that differentiates leaders from managers. Vision cannot be imposed it has to be voluntarily owned by every member of a team as they build their trust in their leader. 2. What is the secret of motivating a team? For me motivation is about ownership and when it comes to the team, group ownership of the outcome. For if people own something they take pride in it and feel responsible for the delivery of that outcome and therefore they will try their utmost to deliver above expectation. “People who produce good results feel good about themselves” Ken Blanchard said and when a leader enables that they have created an environment of continuous improvement. 3. What is the most important lesson you have learned? Most problems in terms of leadership and followership come about through a lack of clear communication. When boundaries and expectations are not communicated then inevitably something falls short. Trust is key in the dynamics of leadership and if someone is perceived to have let either the leader or the follower down that trust is eroded. If it continues that way the relationship breaks down. I learned early in my career to always gain mutual understanding of expectations and boundaries when contracting an individual to perform a task. “The biggest problem with the communication is the illusion that it has been accomplished” George Bernard Shaw. 4. What are the key ingredients of success in business development? Modern business is about speed and efficiency for in this information age, if you study paradigm shifts, it is not the big that eat the small but rather the speedy that consume the plodders. The days of authoritarian leadership and tight control are passed. Modern businesses have to trust their people to deliver through empowerment. To do this they have to select, train, develop and talent manage their people and be prepared for the odd mistake. For empowerment is about investment and it is about progress and not maintaining the status quo. Progress is about pushing the boundaries to continually develop because if you don’t someone else will and who gets left behind? 5. What book(s) would you like everyone to read? Given the theme of empowerment I am going to say Make Your Workplace Great: The 7 Keys to an Emotionally Intelligent Organization by Steven J. Stein .